There are moments of luminosity when, amidst our trudging daily routine, we realize that everything and everyone in the universe is connected in some great, unseen spiritual web. But things are connected anyway. Several weeks ago, Bowie brought a mouse into the house. He chased it from Sam’s study to the dining room, and then under the piano. I chased it too with a broom, trying to herd it outside, but somehow it vanished. Later I noticed Bowie sitting intently in front of our refrigerator, every so often sticking his nose into the narrow crack between the appliance and the encasing cabinet. Mouse, I thought. But it never appeared and Bowie moved on to other more rewarding pursuits such as, um, sleeping. For a while I waited for a bad smell to start wafting from under the fridge. But no — no signs of dead and decaying rodents. Fast forward through the month of June. Daughter’s graduation. A quick trip to Stinson. Work. Zucchini plants growing to look like hedges. The 90-year-old pipe connecting our house to the sewer main broke, and we hassled with contractors and got it replaced for more money than I care to recount. You know the cliche where you say you might as well have flushed money down the sewer? Well, we pretty much did. Then last week Sam noticed a pool of water on our kitchen floor. “Did you spill something?” he asked. “Did you leave the door open and spray the kitchen when you were watering the zucchini?” I didn’t remember spraying the kitchen, but I could easily have done so in a moment of distraction. I apologized and promised to be more careful. Then this weekend, I found a pool of water again. This was definitely not me watering. I mopped it up. A half hour later, it was back. I mopped. It returned. I decided it was coming from the refrigerator. Sam was out of town on yet another of his marathon bike training rides, and I couldn’t move the fridge by myself to investigate, so I kept putting towels down and replacing them with dry ones every hour or so. I wondered: Did the sewer guys somehow break something that was now causing water to back up into our kitchen? I also wondered: Did Bowie’s mouse eat through some plastic tubing that might carry water to the fridge? This afternoon Sam came back and we moved the refrigerator. We didn’t see a visible leak or any gnawed tubing. 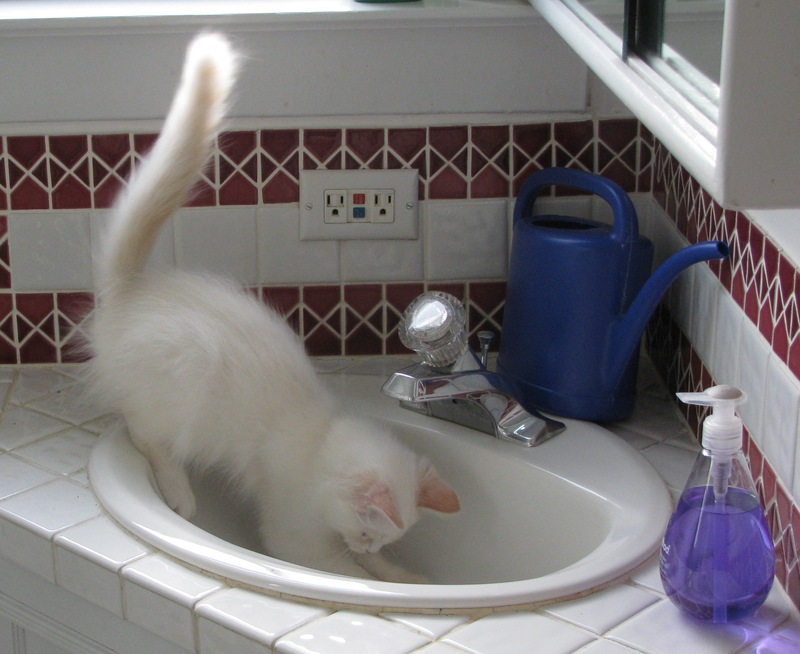 But we did find the switch to turn the water off until I can call an appliance repair person. And we also found a ton of tiny brown mouse turds. Fat little caraway seeds of turds. Someone was living back there. Which raises the question… Where is it now? Today was my third day in Haifa, fourth day in Israel (not counting the afternoon I arrived). I spent Shabbat – my first full day – with an old friend in a small community in the Galilee. Since then, I’ve been in Haifa doing interviews for this Technion book with the main author, professor Shlomo Maital. Distances are SOOO small. I knew this, but it hits home again. 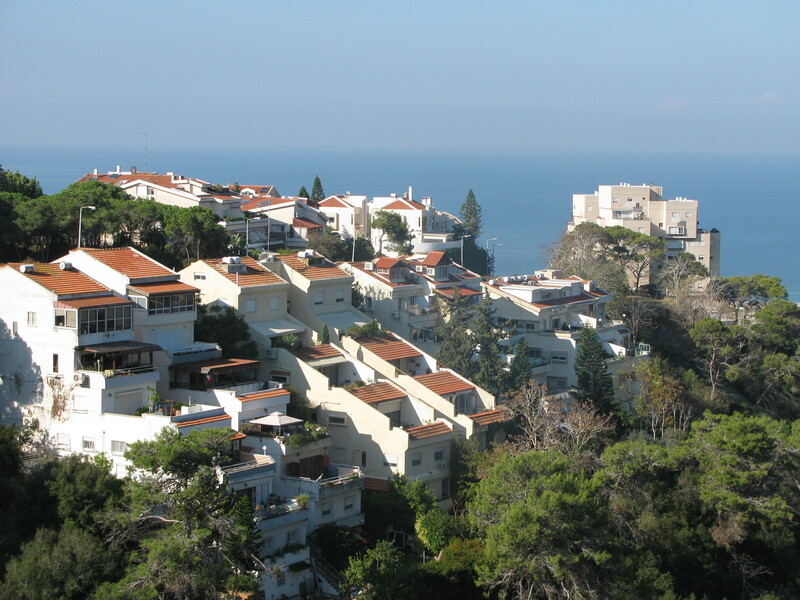 Haifa is basically an hour’s drive from Tel Aviv. Those are two of the three biggest cities in the country. Imagine L.A. being an hour’s drive from New York…. I spoke to several Technion students who commute every day from Tel Aviv to Haifa. I don’t think that happened so much when I lived here in 1985, partly because…. The infrastructure has improved! Well, duh, if it hadn’t improved in 26 years, that would signal a major problem. But the roads here now have fewer potholes than at home in Oakland. 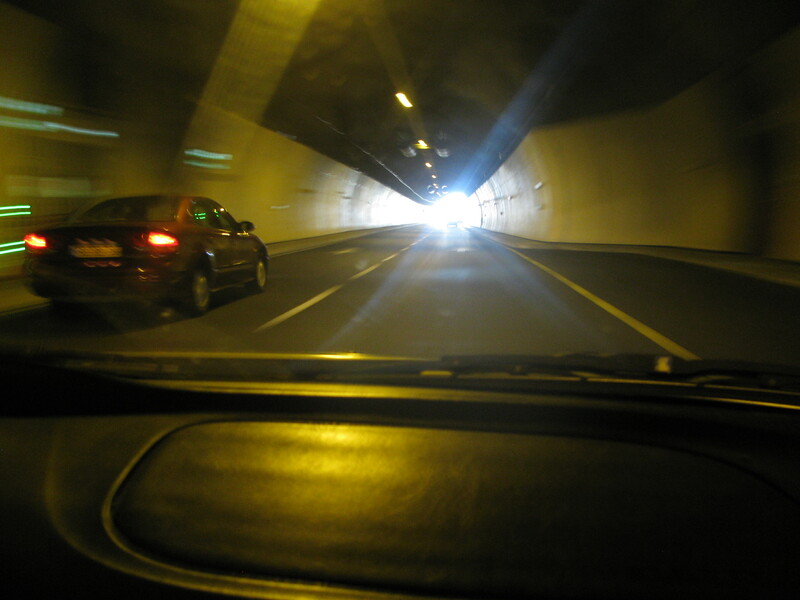 There is a sleek, spacious automative tunnel under the city of Haifa that makes the Caldecott feel like a 19thcentury coal mine. And there is now train service! There are frequent trains from Haifa to Tel Aviv, and further up and down the coast – real trains, not light rail. Soldiers don’t hitch anymore; they take the train back from their weekend furloughs on Monday morning. We took the train to a Tel Aviv interview on Sunday and it was super easy – 50 minutes on the train, then a five-minute cab ride. Sad to say – train service in this little resource-strapped country is faster and more frequent than between the Bay Area and Sacramento. The Wall. Nothing illuminating to say here, just the shock that comes when seeing an abstract political issue made real. My cab ride from the airport to my friend Nomi’s house went north along Highway 6, a new-ish major road that in sections paralleled the wall that was built several years ago separating the West Bank from pre-1967 Israel. There has been so much controversy over the wall, and it is such a symbol of the unresolved conflict and the limbo in which the Palestinains live. And there it was, no longer some abstract phrase in a news story, but a thin metal fence with a bit of wire on top. Not very big. Not very permanent. But suddenly real. The cats. Feral cats everywhere! Feral mom cat with three kittens making a home on Nomi’s porch. 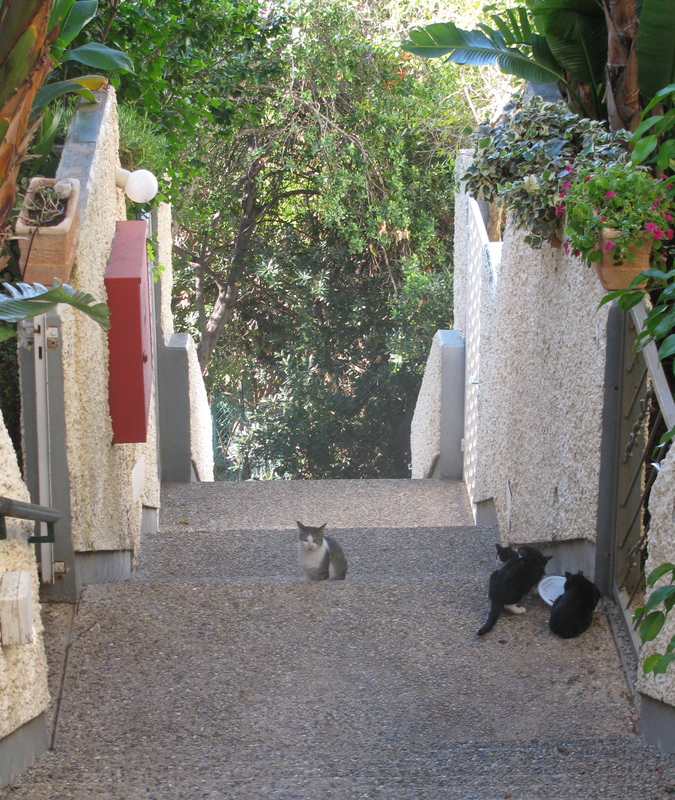 Feral cats mewing pitifully outside my window here at Shlomo’s house. I miss my Bowie! Clearly, once Israel has resolved those pesky minor issues involving peace, minority rights, religious pluralism etc., it is ripe for a major crusade to spay/neuter its cat population. Maybe I should start raising money right now…. I do have some less trivial thoughts and impressions – on the Technion, and on the population bomb you haven’t heard about — but those will have to wait a day or two. Okay, I was all set to write about the high holy days some more. But Bowie just brought a mouse into the dining room. It ran under a pile of cushions on the floor and he spent about ten minutes trying to nose it out. It ran behind the recycling basket and he went after it there. He caught it, tossed it around, and brought it back to the pillows, where it hid and he nosed after it some more. He didn’t seem to be trying to kill it, just play with it. 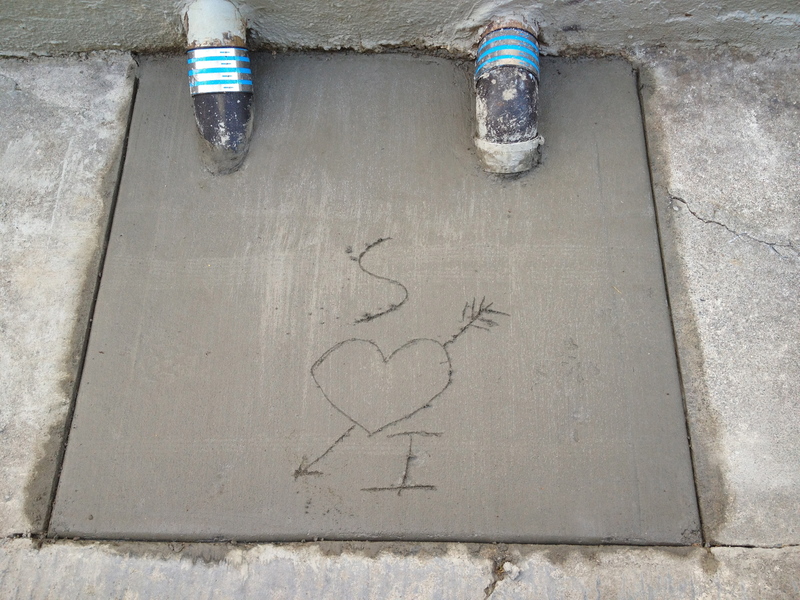 Ilana 1: Way cool! He’s hunting something other than a $2.99 catnip ball! Get the camera! Ilana 1: He’s a cat! Cats chase mice! He’s doing his job! Ilana 1: You complain that Bowie never spends time at home. Now he brings a friend home to play, and you want to take the friend away? Ilana 1: Mice aren’t exactly an endangered species, you know. This mouse is going to get killed by something. Owl, hawk, dog, cat. Might as well be Bowie. Ilana 1: You bleeding-heart liberal. I bet you support gun control too. Whose side are you on, anyway? Ilana 2: Um, I don’t know. At which point I picked up Bowie, handed him to Sam, lifted the cushion, and let the mouse run out the back door. Sam released Bowie, who returned to the pillow and starting nosing all over it. He couldn’t figure out where his playmate had gone. So what am I — traitor? savior? spoilsport? wimp? God? P.S. 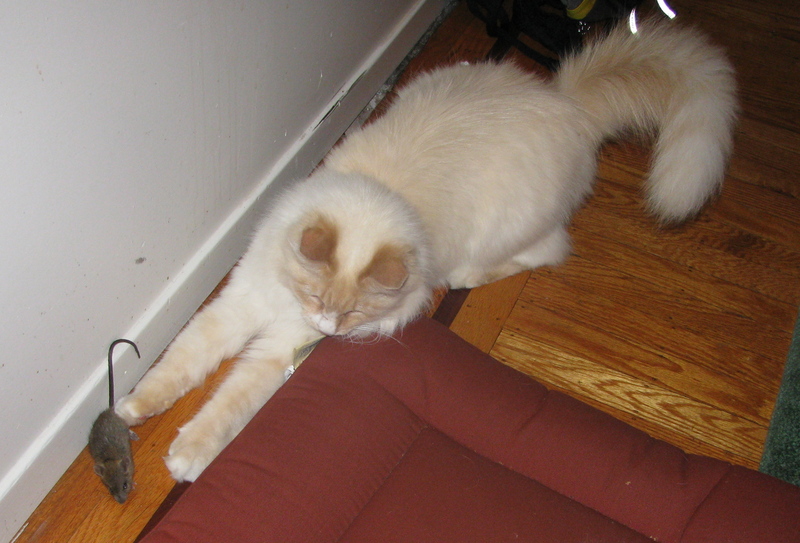 About an hour after I drafted this post, Bowie re-caught the mouse and brought it back inside. This time it went under the piano and I spent 20 minutes trying to get it out with a broomstick and dustpan. Some critters are just too dumb to help. One of the things I like about our cat Bowie is how he sleeps. This is no insignificant part of his life, since cats spend something like 13 to 16 hours each day sleeping. You’d think he might return over and over to the same sleeping spot — we humans do, after all, and we call it Bed — but no. There are a couple of spots he favors, but otherwise he seems to be on an everlasting quest to ferret out new and weird places to sleep. Sometimes he sleeps curled up in a round little ball, so tight he could fit in a salad bowl. (Oh! 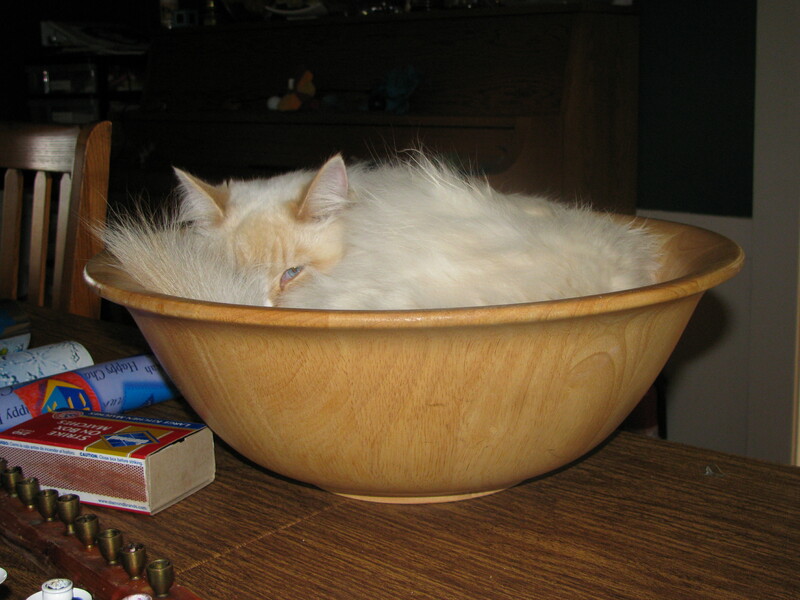 That’s right, one time he did sleep in our salad bowl.) I guess that biologically speaking, this position conserves heat and is less visible to predators. Other times he sleeps with complete abandon, stretched out like the pelt of a dead squirrel, his fluffy belly exposed to the world. I love this because it suggests how safe he feels with us. In any event, all this blather and pontification is just a pretext to show Cute Sleeping Cat Photos. This is my version of nature photography where — thankfully, given my photographic skills — the nature doesn’t move. We have a lovely cat. A good-natured cat. A cuddly cat. Truly, he is the Spongebob Squarepants of catdom — happy-go-lucky and ready to call the world his friend. It’s hard to imagine a better cat. Over the past month or so, Bowie has developed a new routine of trying to get in to our bedroom in the dark hours. We keep him out because of our allergies. Although he’s less allergenic than most cats, we’d still prefer not to inhale fur while we sleep. And he has plenty of nice nighttime options: The couch. The rocking chair near the heating vent. The bathroom rug. The other couch. Becca’s bed — in fact, Becca loves to have him sleep with her. But around 4 or 5 a.m., there’s a scratching on our bedroom door. Then more scratching. A few piteous mews. Still more scratching, which by now is starting to sound like zombies risen from the grave and hankering for our flesh. Then more mews, and maybe a long pathetic sigh. And then — WHOMP! — he hurls himself at the door. I’m awake, so I get up. He’s thrilled. He purrs. He falls all over my feet. He doesn’t want anything as mundane as food; he’s got a full bowl. He wants company, or he wants to be let out. That’s fine if it’s 5:30, which is when I need to get Becca up for school anyway. But sometimes it’s 4:30. Last night, it was 2:30 and 4:30. And even a leisurely 5:30 wake-up whomp is not particularly welcome on weekends. Sucker mommy. I.e., keep getting up to let him out at 4 or 5 a.m. This is the kind of parenting strategy that makes conservative Republicans crazy. Water gun. Okay, so I never squirted Becca as behavioral conditioning. But it worked at teaching Bowie to stay off the kitchen table. Still, it seems cruel when his only transgression is seeking our company. Ferberize the cat. Back when Becca was an infant, one of the trendy parenting books was by a child development expert named Ferber, who offered advice for getting babies to sleep on their own. Ferberizing your baby meant learning to ignore their crying for progressively longer periods of time, so they would become more and more able to put themselves to sleep. We tried it, and honestly, it was harder on the mom than on the baby. It worked. In any case, it seems to come down to three not-really-great options. Maybe I learn to steel myself to piteous mews and Ferberize the cat? The cat is on my lap, head and paws resting on my arm, face buried in the crevice between my arm and torso. He’s purring like an old and noisy air conditioner. The more I pet him, the louder he purrs. His purring embodies happiness. It’s unadulterated, unambiguous happiness. I don’t get this from anyone else in my life. Sure, I make Sam happy but there are always other things — politics, rain on a bike day, the Army Corps of Engineers – that are making him unhappy at the same time. Me too. Even when I’m getting a massage at the gym, my mind is skittering around somewhere. But when the cat is purring, it is total: HAPPY HAPPY HAPPY HAPPY HAPPY. So I sit here at my desk trying to write, and instead making the cat happy. I feel like someone should pay me for this. (The cat?) It is amazing to be able to bring utter joy to another being so easily. Would people be nicer to each other if our gestures were met by purring? Would we grant asylum to more refugees, provide food for more hungry children, if we did this and then heard them PURRING? A couple of months ago, someone told me that cats who are wounded or dying sometimes purr to comfort themselves. I have no idea if that is true, but it struck me as one of the saddest things I’d ever heard in my life. In my office, I eventually have to push the cat off my lap so I can type without my arm falling asleep. Then he goes off onto a bed or a canvas grocery bag or perhaps into a salad bowl, and curls up to sleep — quite content but not quite purring. Like many of us, I use technology so much that I barely notice it. I sit at my computer for hours each day noodling around with novel revisions, blog entries, freelance articles, and it all seems quite unremarkable. Then every so often something makes me remember how new this all is. Recently it was holiday photos. Snapfish had a 30 percent discount if you ordered holiday cards by Oct. 31st, so I corralled Sam, Becca and the cat for the annual picture. When Becca was a baby, I still had to take rolls of film into the photo store to be developed. I’d wait several days to get the pictures back, choose the best one, and return to the photo store to order the cards. Now we use our digital camera and see the results immediately. This year Becca even photoshopped our favorite picture to remove wrinkles, blemishes, shadows and gray hair! (An unexpected benefit to having an artsy teen – we will look younger every year, a la The Holiday Card of Dorian Gray.) I uploaded the photo, clicked through a bunch of card options to find one without any crosses, mangers, trees, ornaments or red-and-green… and that was that. It’s only been 12 or 15 years, but the old process of slogging back and forth to the photo store seems like ancient history. That started me thinking about other technological changes in my lifetime. If you were chronicling your life for archeologists from the year 3000, what would you remember about new technologies? Do you recall a specific time, place, circumstance when they appeared in your life? ATMs. I started college in 1976, just about the time that ATMs were introduced. I remember going to the BayBank branch in Harvard Square to open my first-ever checking account, and getting a plastic card that I could use to get money. Wow! My parents never got money with a card. It felt very cutting edge. COMPUTERS. I used electric typewriters all through college; computers were still huge boxes off in the science building. After I graduated in 1980, I worked for a while as a clerical temp where I was thrilled to be able to use IBM Selectrics. The height of luxury, I thought, would be to have a Selectric at home for personal use. The first time I used a desktop computer for writing was when I was living in Jerusalem in 1984-5 and writing a novel. My Israeli friend Ivonne, a graduate student, had a very early pre-Macintosh Apple. I would hand-write pages at my apartment, and then go over to her house to type them onto a floppy disk. When I returned to the U.S. for journalism school in 1985, I bought a PC (“Leading Edge” brand with its own proprietary word processing program!) and paid to have the files transferred from Apple to PC format. During my first reporting internship at the Waterbury Republican in 1986, we filed stories from the field on Radio Shack TRS-80 computers – warhorses that would have probably survived a drop from the Empire State Building. They had displays that showed about two lines of type – the equivalent of a Tweet! – and rubber cups that you attached to a pay phone in order to transmit your text. I suspect any boomer-age newspaper reporter reading this blog remembers them. EMAIL. When we were starting to organize the Julia Morgan School for Girls in 1996, email was still relatively new. We had long, earnest discussions about whether it was equitable to send messages to parents by email – would we be excluding families without the means to buy a computer? Today those discussions seem quaint. The school hasn’t sent out a paper newsletter for years; everyone reads it on the web site. Those were just the first personal takes on tech history that popped into my head. It’s interesting how we date historical events — whether technological change, moon landings, or political events — by remembering where we were and what we were doing at that moment. How about you — any moments in your life that are linked to the arrival of a new technology? Some things, of course, remain the same despite any and all technological changes. 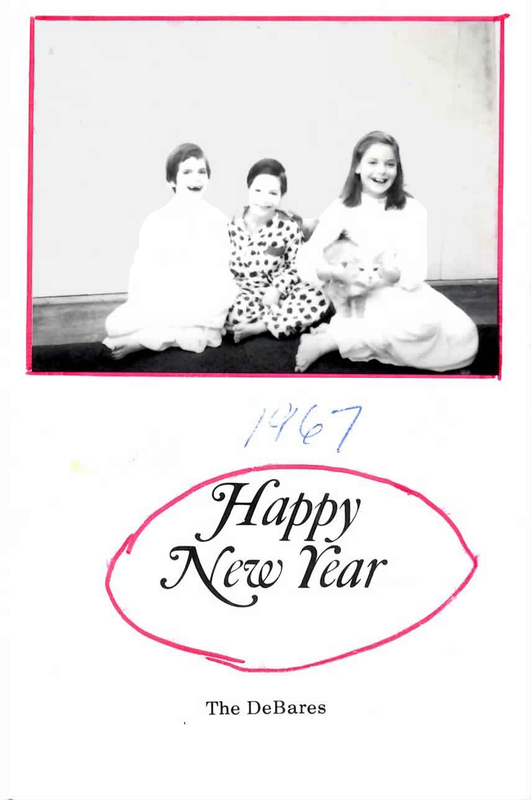 When I was little, my parents took Instamatic holiday photos of the three of us kids and the cat. The cat invariably was half out of the picture, squirming and clawing to get back under the bed where life was sane and normal. If you look at our 2010 holiday photo at the top of this blog post, Bowie doesn’t seem much happier. I guess you could photoshop some kind of Zen-relaxation-expression onto a cat. Or you could photoshop in the entire cat. But somehow the holiday photo experience just wouldn’t feel the same. There are a number of cats that pass through our backyard, which is a kind of Route 66 between our tier of houses and the tier above us on the hill. Most of them simply skulk on through. One hisses at our 9-month-old kitten Bowie. But another cat, a large grey adult male, has started hanging around. His name is Cato and he’s not skittish around humans, but not particularly friendly to us either. 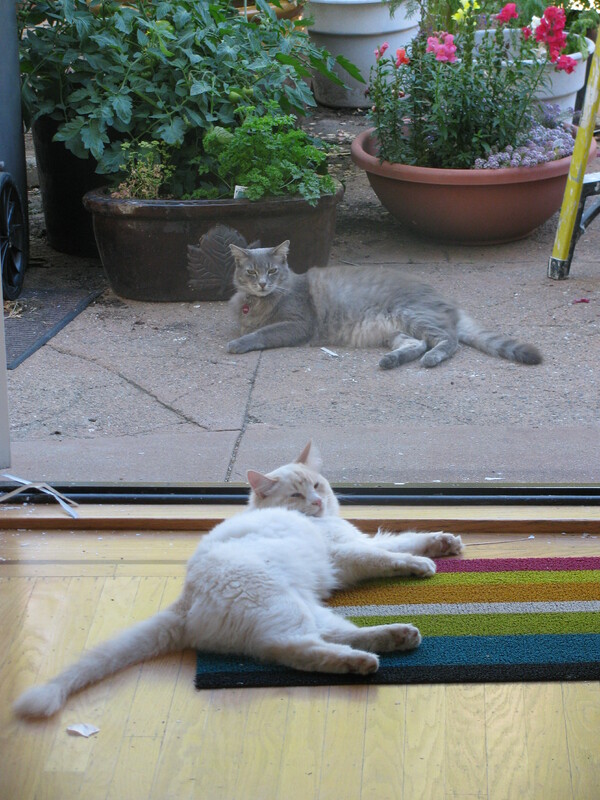 On numerous occasions I’ve watched as he and Bowie lie around in the backyard near each other. Once in a while they approach each other and almost touch noses, but then one raises a paw or they both back off. No licking, no cuddling, no playing, but no fighting either. Is this feline friendship? On more than one occasion I’ve also found Cato in our dining room eating from Bowie’s food bowl while Bowie rests nearby, watching but seemingly unconcerned. Clearly Bowie is secure in his identity and a generous soul. Usually I shoo Cato out, since I’m pretty sure his owners wouldn’t want him cadging extra dinners. But is this the right thing to do? Am I being an ungracious hostess? After all, Becca has friends over all the time and I feed them. I make muffins. I buy bagels. I boil pasta. Two of her friends are in fact watching a DVD downstairs as I write this, and I will doubtless give them cereal and fruit salad tomorrow morning. If Cato is Bowie’s friend, doesn’t he deserve the same? 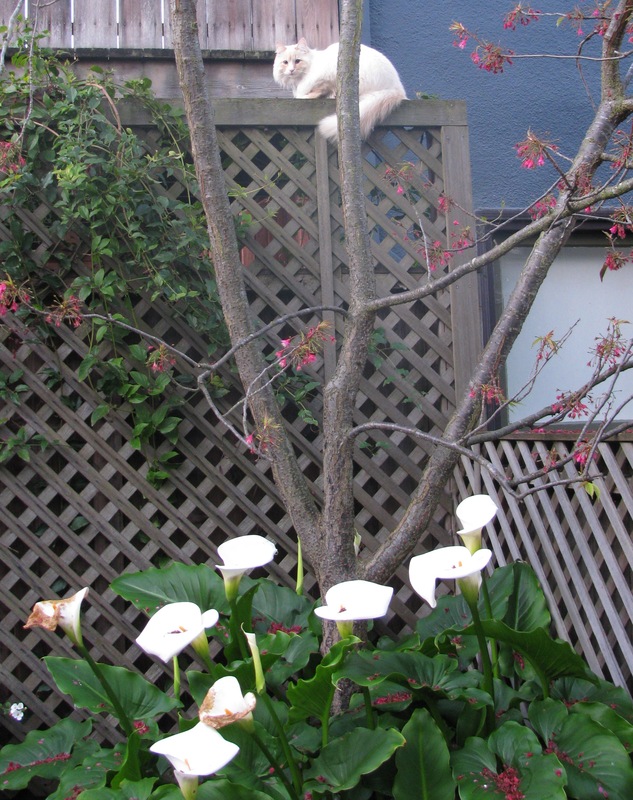 In the past, I’ve had single cats who hissed at or ran from their compatriots. Or I’ve had kittens who grew up together and played and cuddled. I’ve never had a cat with a friend… if this is what I’m seeing. So I’ve got a maternal worry. I guess it’s kind of what I will feel when Becca someday has a boyfriend. Does Cato like Bowie for who he really is? Or is he just using him for his food? Side Point # 1: He is a particularly Loved Cat since both Sam and I are allergic to cats, and had to give away two cats several years ago. This one is a Siberian, a breed that often has lower levels of the allergen that bothers humans, and came from a breeder who specializes in breeding for low-allergen levels. We had a dicey few weeks there at the beginning, but with two visits to the allergist and a slight adjustment of asthma medications, we are A-OK and cat can stay. Side Point #2: He has been a blessing for my relationship with Becca, our 16-year-old daughter. Becca really, really, really, REALLY wanted a cat. She has been visibly happier since we got him, which for a teenager dealing with all the usual teen angst is no small thing. And we suddenly have a shared activity. She comes home from school, and instead of closing herself in her room with her iPod, we play with the cat. Or tell stories about the funny things the cat did earlier in the day. Or kvell together about what an incredibly excellent cat he is. The cat has, amazingly, made home into a place where this 16-year-old wants to be. Which makes us all happier. I think about this cat getting old and dying a lot. Typical morning: I’m at my computer and the cat is sitting on my lap. He’s about six months old, small and still growing. I stroke his soft fur. I smooth his ears back, which he likes. And I imagine him an old cat, kind of scrawny and drooling and not doing so well at getting to the litter box in time. I picture him moving slowly, playing less and sleeping more, trying to jump onto things and not being able to make it. I can see in my mind’s eye what this kitten will look like at the end of his life. I can almost feel it when I pet him. I didn’t try to imagine what Becca would be like in the future – didn’t try to picture her as a preschooler or teenager. I couldn’t have imagined it even if I tried: I didn’t have a clue what preschoolers looked or acted like! Basically, I read one chapter ahead in the parenting books and lived in the present. Now, with cats at least, I know. We had one cat who got cancer and had to be euthanized. We had another who was run over. I have friends with old cats and sick cats. If we’re lucky, of course, this cat will live to a ripe old age of fifteen or sixteen. And if I’m lucky, I will outlive this cat. I will bracket his life in mine – I will know him when he is a crazy, funny kitten and then a staid adult cat and finally a doddering old cat. There are not a lot of other beings that we can say that about. Our parents? Even if we witness the end of their lives, they were around long before we were. Our children? Hopefully they will be around long after us. Maybe our siblings, but our lives move in such parallel tracks that it is hard to have that kind of “bracketing” perspective. So what’s the point of all this? I’m not sure. It does make the cat even more precious to me. And I’m aware that this is not a perspective I would have had ten years ago with our previous batch of cats. It’s one of those midlife things: I think about endings now. P.S. On a lighter note, the kitten is named Bowie. That was Becca’s idea, after David Bowie. And he truly is the most wonderful, affectionate, cute cat in the world.